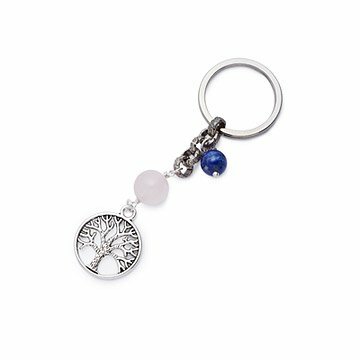 This keychain features a trio of charms that symbolize growth, wisdom, and love. Keep a symbol of growth, wisdom, and love firmly in your clutch. This keychain by Szilvia Gogh features a trio of inspirational charms that each possess their own special meaning. The stainless steel tree of life is a universal symbol of renewal and perseverance; rose quartz speaks directly to the heart chakra; and lapis lazuli—a stone prized through the ages for its magnificent azure shade—represents intelligence and truth. Together, the three elements provide a beautiful reminder to go boldly through life and unlock your destiny. Handmade in California. Szilvia Gogh's mission in life is to encourage everyone to challenge themselves by living by the mantra "do one thing every day that scares you." She would know: When she's not moonlighting as a jewelry designer, she’s hosting an adventure show and performing stunts in Hollywood blockbusters. She started making jewelry in her late teens because she couldn't find silver jewelry for the adventure-hungry. Her pieces pair metal with semi-precious stones, as well as curios such as reclaimed wood and seashells discovered during her trips. Born in Budapest, Hungary, Szilvia now makes Los Angeles home. Keychain fell apart after two weeks,the link came undone. This item is a gift for a friend who loves trees. It was the perfect "form and function" gift idea. I am very satisfied with the quality and the packaging is thoughtful and just as unique and artistic.